The Council is a thrilling tale of planning permission, finding out when bin day is, and getting somebody to come out and fix that fence that fell down three months ago because really, it’s getting ridiculous now. We jest, of course. It is in fact an episodic walk-and-click adventure set in the late 18th century, which takes long strides away from similar games in a surprising and very pleasing direction. The game opens with your character, Louis de Richet (who looks like a cross between David Tennant and Wolverine), and his mother Sarah at the mercy of A Bad Man. They escape – it would be a very short game otherwise – and it’s made clear (a) mummy is a bit of a badass, and (b) she doesn’t necessarily have the closest relationship with her son. Nonetheless, when Louis receives word that she’s disappeared on a secluded island, he’s understandably worried, and goes to investigate. We now have a decent selection of walk-and-clicks to choose from in 2018, not least thanks to Telltale’s impressive catalogue. It’s become difficult to stand out in the genre, but this is something that Big Bad Wolf has achieved in a way that deserves thunderous applause. Exploring your environment is important – you can discover consumables, clues, and new topics of conversation – but the real innovation comes from the dialogue system. The game doesn’t look quite this sharp, but with lots of sumptuous Renaissance art to admire, who cares? Having a choice of questions and answers for those you meet is nothing new (it’s demanded in the genre after all), but The Council takes this idea and runs with it; runs so far, it makes other games look like they’re merely shuffling around the same spot. You’re told that each person you meet has a unique personality, with different vulnerabilities and immunities when it comes to the flow of conversation. It’s a bold claim but, so far at least, one that holds up very well. One character might soften when you try to empathise with them, for example, while another will be suspicious of your motives and lash out. Some respond to rational arguments, others are weak to flattery, and so on. Despite the game mechanics at play, and a UI that makes your choices clear, it all feels very natural. In a bold move for a game like this, your character levels up, earning points to distribute across a skill tree. The vast majority of these skills are relevant to dialogue and knowledge, determining which conversation options are open to you and if, for example, you are able to pick locks or read Latin. Although the personality type you choose at the beginning immediately opens up certain opportunities while blocking off others, as you progress you’ll be able to gather a wide variety of skills rather than concentrate on a few, if you wish. While the skill system guides your path to an extent, it’s the actions you choose that have the greatest effect on the story you are told. 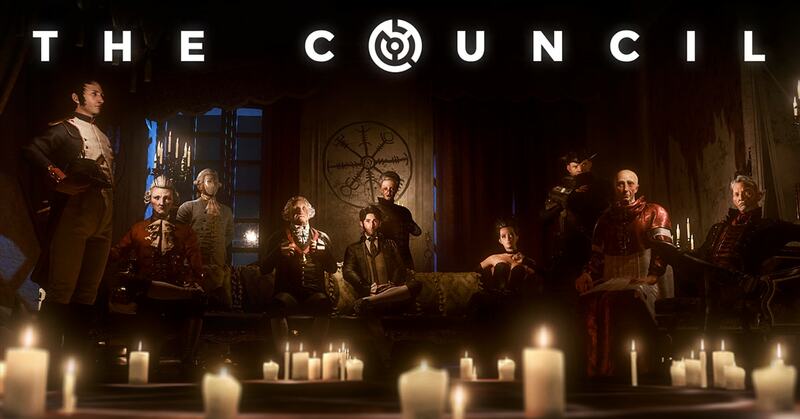 Unlike pretty much every other game of this type, where your choices lead to new dialogue or scenes but otherwise have a negligible impact, there’s a lot of content in the first episode of The Council that you’ll never see in a single playthrough due to the path you take. You can miss opportunities to search rooms and run into characters, there are entire conversations you’ll bypass, and plenty of physical items and information that are only accessible with the right skills and inclination for exploration. Each episode is split into ‘quests’ (basically chapters), and at the end of each it will be made clear to you how much you missed without spoiling the exact details. The final few choices of the episode could potentially have a huge effect on the rest of the series… but we have to wait and see about that. You don’t have unlimited use of the aforementioned skills, and using them drains your limited pool of ‘effort points’ (restored or bypassed via consumables). Don’t think that spending points will automatically ‘win’ a conversation, either; as we found out the hard way, if you try exploiting a skill that hits a character’s immunity, it will backfire. There are several instances where you try to gain a character’s trust to gain something from them, and you can only mess up a few times before you fail. As impressed as we are with what this game has achieved, there are a few minor niggles. What chafed the most for example was not the occasional frame rate issues, but the liberal distribution of modern American accents. This was most bizarre when it came to the Frenchman Jacques Peru. It’s also a little jarring to find keys in seemingly random places, leaving us to assume that everybody has holes in their pockets or are extremely forgetful. The use of historical characters such as George Washington and Napoleon Bonaparte should feel gimmicky and awkward… but it doesn’t. The acting is a little uneven, which doesn’t help, but none of it is outright terrible (and the actress playing the part of the troubled Elizabeth Adams does a superb job). We were thoroughly impressed, and look forward to the second episode with breath fully baited.